Pulissery is a traditional Kerala dish known for their sweet and sour taste. Pulissery can be made with any fruit or vegetable but only few of them are my favourite. Pulissery generally makes use of seasonal fruits like Ripe Mangoes, Nendram Pazham or Pineapples whereas vegetables like Ash gourd, Pumpkin etc. This.This Mampazha Pulissery is very sweet but tangy one too. It is better if you can use nadan mangoes for this preparation as they are more sweet and tasty. 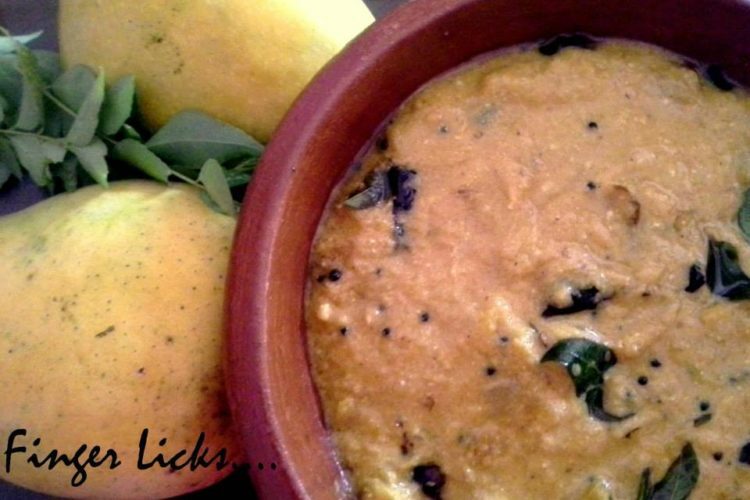 is a curd based traditional Kerala vegetarian dish is famous for their flavour made with ripe mango in a coconut based gravy.it is one of the recipe from our old ancient history.In those old years mangoes very easily available in the backyard. This Mampazha Pulissery is very sweet but tangy one too. It is better if you can use nadan mangoes for this preparation as they are more sweet and tasty. This is also a common dish in Kerala sadhya / feast. Cut the mango into pieces and boil in water along with turmeric, green chillies, chilly powder and salt. Grind the coconut with the cumin seeds to a fine paste and add this to the boiling mango. Bring this to a boil and take off the flame. Blend the yogurt to make it smooth and add this to the mixture. Heat oil in a pan. Add mustard seeds and when they crackle, add red chillies and curry leaves. Add the seasoning to the above mango curry and mix well. Sprinkle fenugreek powder and mix well again. Serve with steamed rice.